Judaea, Jerusalem. Yehud. Hemiobol, 0.37gg. (4h). . , Persian Period, before 333 BCE. Obv: Lily flower. 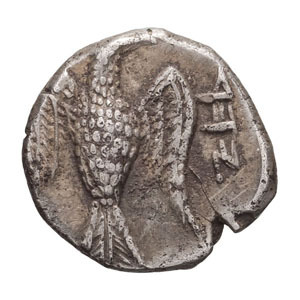 Rx: Falcon standing front, head right, wings spread, to right Hebrew inscription YHD. Sofaer 10, p. 241, pl. 193. Hendin 1060. 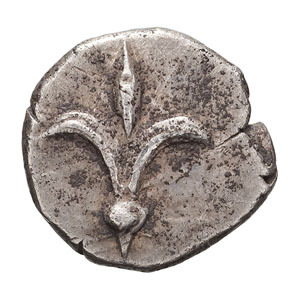 Of this series of hemiobols of Judaea, this coin has always been considered the most desirable. It is so rare that Hendin has only owned this issue once. While the head of the eagle is off flan, the legend is complete. EF. NGC 4625017-003. 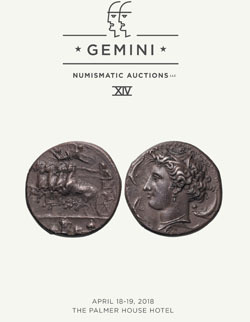 Purchased from Herakles Numismatics, 6 March 2011.